I find that Chinese airports are good places to buy fine single malt whisky. 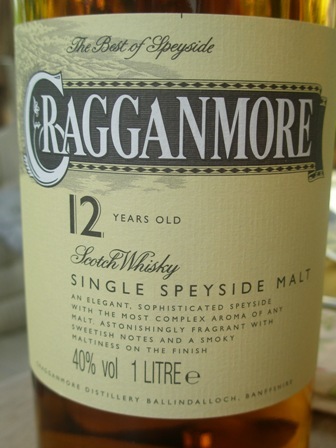 I was lucky to pick up a bottle of 12 year old Cragganmore from the Speyside, North-east Scotland. 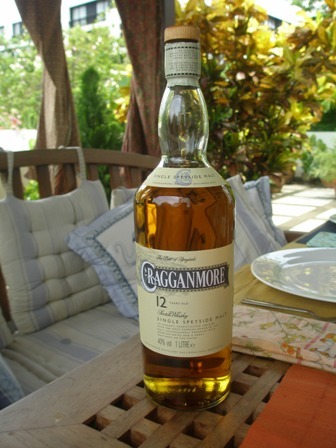 In Michael Jackson’s Malt Whisky Companion this whisky is given 90 points which is quite remarkable. And this at the costs of only 328 Yuan (Shanghai Airport). Shanghai would not have been as much fun without the above book. 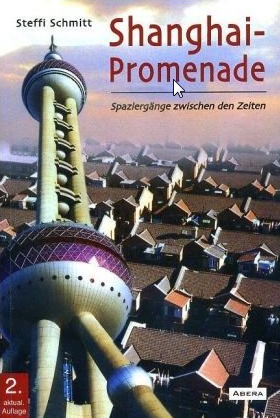 If you are a German speaker, the best book to read before traveling to Shanghai is Steffi Schmitt’s “Shanghai Promenade – Spaziergaenge zwischen den Zeiten” (freely translated as: “walks between the times”). It gives you a fantastic head start into the fascinating world, past and present, of the “Paris of the East”. I was so glad that I had mastered about 200 pages of it before descending on the city. My ignorance was much less than otherwise and I felt relieved somehow. I saw the town in an historic perspective which made it much more palatable. Because of the building boom of the last 20 years, it is easy to forget that this town is loaded with a very interesting past. From page 385 onwards, Steffi describes 10 city walks. When I strolled along the Bund, all these historical facts came to mind and I felt like a real time traveler. Unfortunately, I had no time for any of them because my work schedule was just too tight. But it made me hungry for more, to visit the city again and spend some time to explore it’s beauties. It’s easy to get this book. Just google the title and order it through Amazon or any other provider. The only thing I missed in the book is maps. I would love to have more maps in order to be able to locate events and places in general. But for the 10 proposed walks, no worries, there are maps guiding you through. Shanghai has seen a tremendous development over the last 10 years. Last year when I visit the “Paris of the East”, as Shanghai used to be called, its famous “Bund” was still closed for renovations. 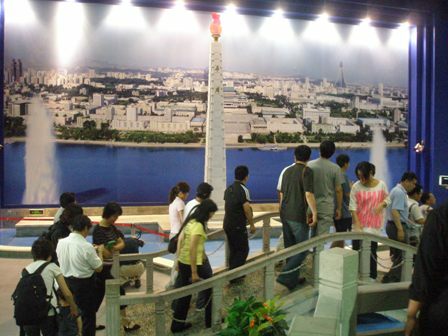 With the World Expo came also the re-opening of this part of the metropolis which presents itself in a new incarnation. I had dinner with an old friend on the terrace of the South Beauty restaurant 俏江南 overlooking the Huangpu river on the 10th floor of the Super Brand Mall in Pudong. 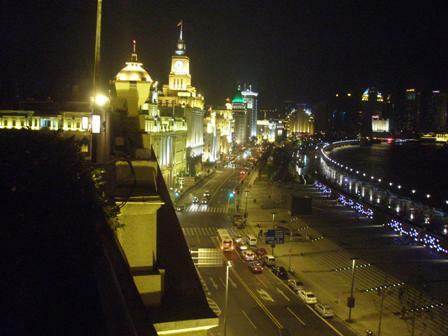 The terrace offers a splendid view at night. South Beauty is a chain restaurant with dependencies in the capital Beijing and other provinces. It is seen as one of best Sichuan food restaurants in Pudong and Shanghai. The food was good, but we ordered too much of it. We were rather late and the service was friendly but quite slow. But I liked the food. In internet reviews South Beauty received varying reviews. Some rank it 57th of the 320 restaurants in Shanghai, other see it as 100. Some reviewers see the quality as 3.5 out of 5, others rank it 8 of 10. After our meal, we crossed to the other side of town. because it was late, we had to take a taxi but there is a tunnel under the Huangpu river which is spectacular transportation. If in Shanghai you should try it, instead of a taxi. our object was the terrace of another landmark of Shanghai’s nightlife: M on the Bund. I had visited it’s sister restaurant, Capital M in Beijing a couple of months ago. The terrace is wonderful and the new Bund presents itself as it always did: in great style. The Glamour Bar, one floor below M on the Bund and run by the same owner, is the place to have what we German’s call “Absacker”, a night cap. Opened in January 1999 M on the Bund is located in the Nissin Shipping building which was built in 1921, the same year the Communist Party of China was founded (also in Shanghai). The Miele Guide ranks the restaurant as one among the top 20 in Asia! That’s quite an achievement. The picture above gives you and idea of the views. The place to be, I guess. In between meetings I had the opportunity to visit the World Expo in Shanghai. Goodness me how many Chinese visitors flooded the place. Their interest in foreign nations and foreign culture seemed without bounds. Already early in the morning long queues built up very quickly so that people had to wait for 2-3 hours before they could enter a pavilion. 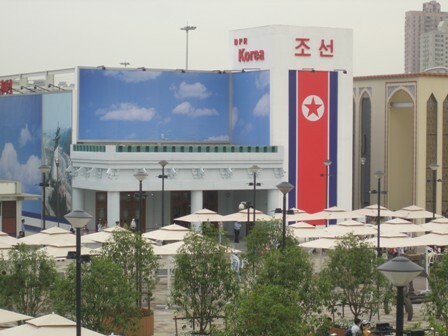 I manged to see only three country pavilions from the inside: Bangladesh, Mongolia and North Korea. I did not have to queue up for either of them. The casual visit was very educative. Now I know where the people are king: in North Korea. The main slogan in its pavilion was: Paradise for people. I must have missed something. Abduction of foreigners, gun boat tactics, and starvation comes to mind; senseless nuclear programs to take the world hostage and pay for the extravagances of one family and medical treatment of its leader. Go north young man and migrate to this country of the gods, where people live in paradise. 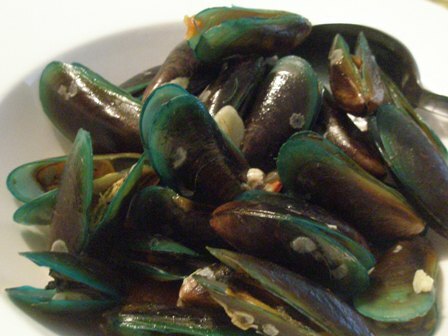 These days mussels are inexpensive in Bangkok. So why not having a large pot of mussels of Sunday lunch? Done. I like them cooked with chorizo sausages. 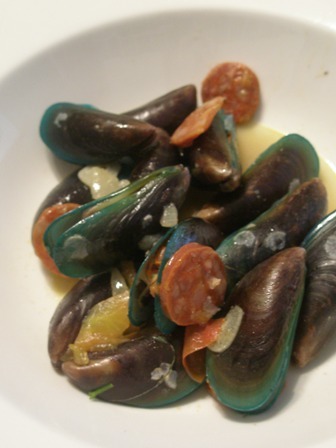 In this combination of flavours the mussels are amazing. The pork sausage with the red paprika somehow bring the shells from the sea “to land”, so to say. The dish has bite. What to drink with it, was the question? White, OK. But I could not think of any better wine than a Riesling from Alsace. Fortunately, such a Riesling was just at hand. 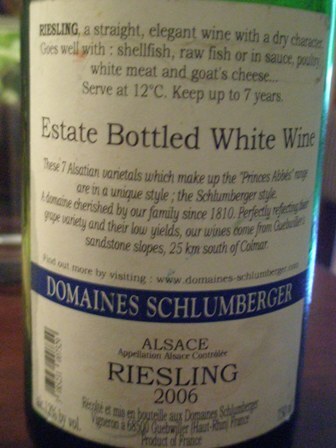 The ‘2006 Les Princes Abbés Riesling’ from Domaines Schlumberger in Guebwiller, about 20 km south of Colmar, Alsace, France, was the ideal wine to go with our food. 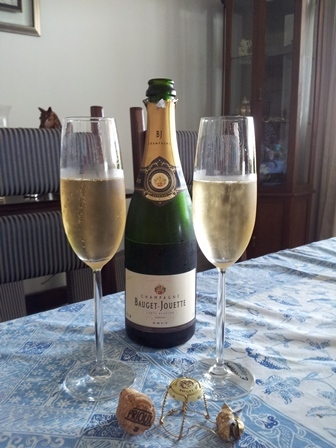 Since 1810 this estate is in the hands of the Schlumberger family. That’s lot’s of tradition in an Australian context. It started with 20 ha under vines. Today the family farms (in sixth generation) about 140 ha of vines of which about half is classified as “Grand Cru”, best locations. 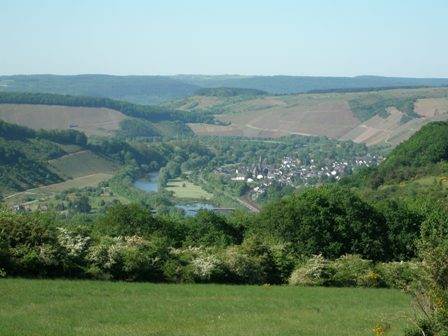 The location (terroir), “The Princes Abbés” ,originally belonged to the monastery in Murbach. Monks always knew what was good for body and spirit. Today “The Princes Abbés” label offers seven Alsatian wine varieties. It is does not belong to the Grand Cru locations of the estate (4 “terroirs” : Kitterlé, Kessler, Saering, Spiegel). The Schlumberger’s grow all the fruit for their wines themselves. Yields are kept low. Many vineyards are very very steep. The Schlumberger’s also use drought horses to work their vineyard. This is also one of my dreams when finally settling in Glenburn, Victoria. I intend to buy a pair of Percheron horses for farm work. The Schlumberger’s farm more land in the vicinity of their vineyards according to organic and bio dynamic principles. Total wine production per year is about 70,000 cases. Well, I should acquire some more of their bottles. 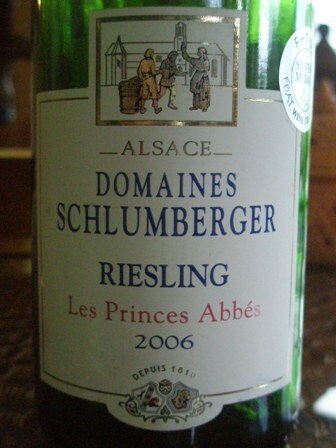 “The Princes Abbés” Riesling has great character. 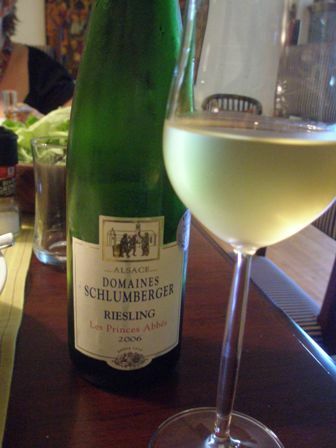 It has zest and structure and is a citrus bomb with the oily characteristic of the Alsatian Riesling. I should visit the Alsace again. It’s such a wonderful region, easy to reach, just about a two to three hours drive south from Frankfurt. See you there, maybe? What do you do if there is a curfew at night? You celebrate in the daytime and this is what we did. 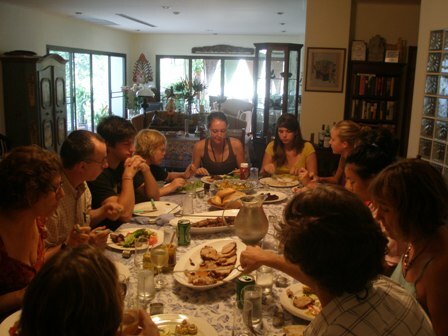 We invited two families with their children and the 13 of us had a great time last Saturday. Starting at 1 pm gives you plenty of time, and we love it if our table can be put to good use. We can easily sit 12 persons, and I just sneaked in on the corner. As it is Australian custom, the man has to operate the barbecue, and that’s what I did. My Weber is doing a great job. The recipes came from Italy though. I had a large piece of pork which we prepared the Italian way as “majale al rosto”. Moreover, we had, Italian “spiedini”, skewers consisting of spicy sausages, beef, bacon and sage leaves between them. All delicious stuff. And what comes at the end of an Australian barbecue? 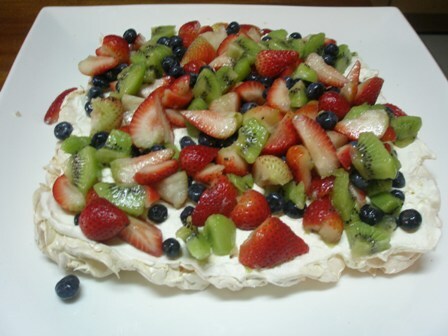 Right a pavlova, the wonderful and delicious, classical Australian dessert, especially if it has 40 Celsius outside. We drank mostly beer but had also a couple of bottles of ‘2008 Yering Chardonnay’ from the oldest vineyard in the Yarra Valley, which they “flog” in our local supermarket at the moment (but which still costs about 12 EURO/bottle). What a jolly good time we had. Soon, I will go the China again, and I very much look forward to this visit. 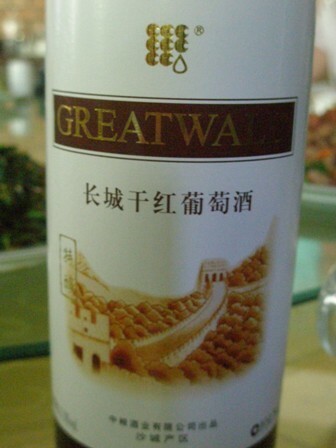 When we moved to China in 1990 we were so happy that wine made from grapes was available at all. That was the time of the first French- or Italian-Chinese joint ventures. Ever since the Chinese wine industry has made great progress. However, if you look for boutique vineyards, China is the wrong place. China after all was and is a beer drinking place. In the countryside it is “bai jiu” (high percentage white liquor or Schnaps) made from maize or sorghum (gao liang) which is consumed in large quantities. 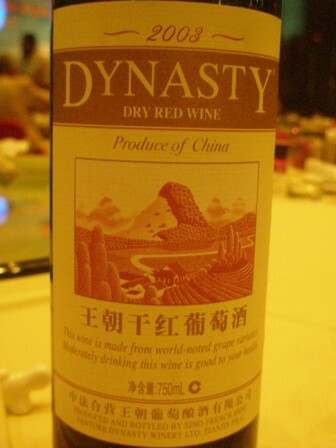 Most of the grape wines on sale in shops and supermarkets in big Chinese cities come from the corporate wine producers such as Dynasty Wines or Great Wall Wines. In 1990 Dynasty, a joint venture of Remy Martin set up in Tianjin in 1980 (only the second joint venture in China at the time), was already 10 years old. As everything, wine-making goes back a long way in China. However, after the end of the cultural revolution and the start of the economic reform era, there was hardly any expertise left. With the help of wine-makers from France, Italy and Australia, Chinese vintners have made remarkable advances. The product range of the large corporate producers is quite impressive. Today grape wines are gaining popularity. 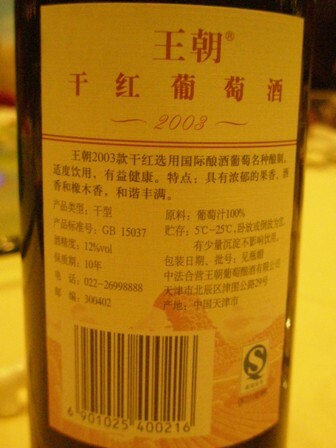 Especially red wine is popular among male consumers and a kind of status symbol as well. 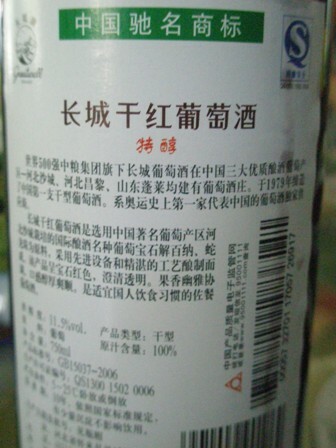 For Western wine connoisseurs some of the consumption habits of the Chinese are strange (or disgusting). For instance the custom of drinking first class Bordeaux wine mixed with soft drinks, called “Red wine set menu” (one bottle of red, ice and two cans of sprite or coke). The largest producing region is Yantai-Penglai in Shandong province with about 40% of total production in China. 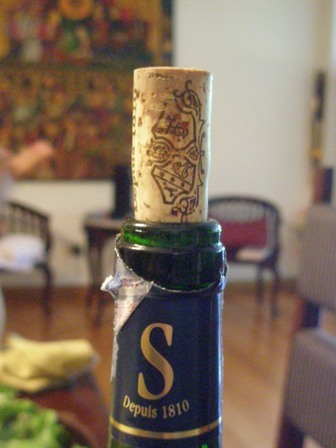 It is estimated that China will match the quality of Bordeaux wines in about 50 years time. I will check it out next week. I’ll keep you posted. You are currently browsing the The Man from Mosel River blog archives for May, 2010.